Wigwams Scotland... Your Guide to the Best Glamping. I started writing this article because I wanted to investigate Wigwams, Yurt and Tent Glamping in Scotland and bring them together to show you the most stylish ones in one feature. But when I started to do the research I realised there was a HUGE number of different small structures being put up all around Scotland being called ‘Glamping’. And another huge amount of structures being called Wigwams. Here’s just a fraction of the types of accommodation I have seen - army trucks, French Roulotte wagons, small wooden cabins, luxury wooden cabins, half-sphere pods, tree houses, ferry terminals, sheep sheds, hen hooses….. you get the picture. There is a triangular wood cabin I see quite a lot being called a wigwam too. But I think for the purpose of this article (and in my mind) a Wigwam is made of canvas – a yurt, tipis or tent type structure. So within this article, this is what I’ve focused on. All the best places where you can sleep under canvas, in luxury, in Scotland. 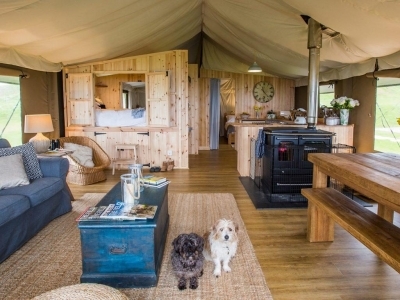 So why has the concept of glamping become so popular? It’s become apparent that people view the main benefits of a holiday in Scotland to be the spectacular countryside, and quite rightly so. People want to get away from the busy cities and wake up in nature – wander in the woods, sit on dirt, feel grass between their fingers and let their kids run wild in the wild without the hindrance of rules and etiquette – let their imaginations do the work and not the TV or tablet. It’s also a sustainable choice – we are starting to think about the environmental impact of our holidays, and a glamping situation by its very nature is low impact. Many of the businesses listed here are also going that extra mile to make sure that they are very much putting back into the earth what is taken out in a variety of ways – I’ve seen recycling, energy production, earth friendly washing facilities, protection of wildlife, biodiversity, planting forests and gardens, and just generally keeping things natural and wild for our future generations to enjoy. Good stuff huh! Of course, this is Chic Scotland, so I’ve only chosen the sites that have been beautifully put together with a flair for style. And why not eh! This is gentle adventure, with enough of your home comforts to keep you, well… comfortable. Furthermore, the location has to be stunning and with a decent amount of privacy and garden for each Wigwam, Yurt or tent. I hope you like my choices. Lets kick this off with one of my fave’s first, this place is dreamy. Okay so firstly, lets start with the location, the island of Arran - there’s something about being on an island isn’t there? and arriving to your holiday destination by boat! You just feel safer - it’s smaller and more manageable, and also friendlier somehow? 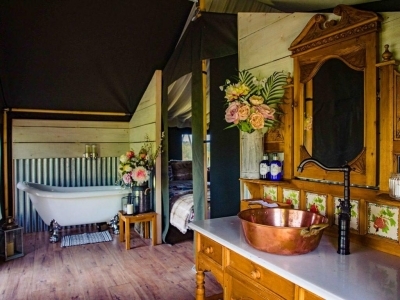 The self-catering glamping accommodation here is luxury yurts – all with private bathrooms, proper double beds and wood burning stoves, fire pits and sofas. There are only 3 on the site, so it’s a lovely intimate arrangement. The site is set in a small orchard and each yurt comes fully equipped with all you will need for your holiday including bedding, towels, crockery and cooking utensils. 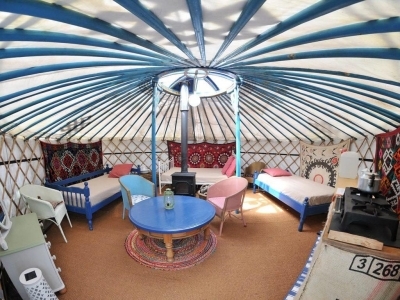 Two yurts can sleep up to six people and the third can accommodate up to four people. Each is ideal for a romantic break or as a base for an adventurous family holiday. In addition there’s free WIFI. Pippa and Andrew, the lovely owners are also assisting the environment to thrive by having created their own perma-culture - a biodiverse forest - great for wildlife and a huge plethora of other environmental benefits. I mean seriously, how lovely does this all sound. Natural, wild and tres tres chic! 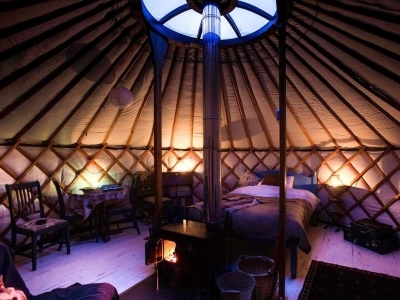 One of the owners of this fabulous family business is an actual Yurt builder! So as you can imagine, this is truly one of the THE best places in the world to go glamping in a yurt! The views are absolutely incredible and there’s direct access to a little sandy beach! Set in it’s own little private woodland; this is an exclusive, eco-sensitive wild-glamping site, offering you complete privacy and tranquility. By the way, I love Scotland’s place name confusions – for example, the local governments change the names of the regions around every twenty years or so just to keep you guessing. Also, Black Isle is not an island, it’s a peninsular just north of Inverness. Either way, there is so much to explore in this area, and these handmade yurts are SUCH a wonderful accommodation option. Don’t worry about feeling chilly in the colder months, there’s a wood burning stove which keeps you cosy. This is a small but magical off grid eco glamping site using luxury furnished Bell Tents in a stunning location on the North West of Skye. Each tent sleeps up to 3 people comfortably on real beds and a 4th if required on a camp bed. The tents are furnished with recycled and upcycled furniture and come with all duvets and cosy bedding and throws. Each tent has its own fire pit as well a social fire pit next to the social hub/camp kitchen with its own pot belly stove for those cooler evenings. Relax, read a book, stoke the fire, play cards, drink some wine, turn off from the world – what could be better. Catchpenny is truly amazing – everything from the perfect location overlooking the sea in the East Neuk of Fife near Elie, the incredible luxury tents, and the lovely and efficient people who run it. A hidden gem, but not for much longer I fear – book now to avoid disappointment. Dam View wins my heart over to be honest because I love beautiful, beautiful styling. Enjoy the breathtaking views from the front of your tent while listening to the sound of wildlife, the smell of the wood smoke from your fire pit while cooking outside on an open fire. Situated on a 100 acre farm near Stirling, so unbelievably, you’re less than an hour from both Edinburgh and Glasgow. The owners here really have put the indulgence and opulence into glamping. Each lodge has three bedrooms, a well equipped kitchen, a roll top bath, wood burning stove and luscious fabrics, cushions and candles for added WOW! Why be Cinderella in the castle when you could be Maid Marion and Robin Hood having more fun in the forest!? With a beautiful location in the grounds of Dundas Castle, but in the forest by the water, these canvas cottages are such a great choice for a gamping trip, and you are ridiculously close to Edinburgh but still immersed in nature. They include hardwood floors, custom wooden furniture, a wood burning stove, cooking facilities, full length mirror, en-suite bathrooms and lot of other luxury facilities like hot running water, towel rails, comfy beds and hot water bottles. You’ll also find towels and plenty of biodegradable toiletries for you to use. Outside on your wooden deck is a gas BBQ, patio heater, and a bistro dining set. Tea, coffee, milk, and water is all provided too. With Edinburgh soo close, you can head into the big city should you wish to experience a nice restaurant or museum. I can see why they’ve used ‘Glampotel’ – almost like a hotel room in the forest huh! Probably the least commercial operation of my suggestions, but a unique, natural and authentic experience awaits over on the west coast of Scotland. Ardfern Tipis is a small, family-run laid back operation, open from May to the end of September, it is set in five acres of woodland on the hillside above the village of Ardfern. There are Tipis, but I believe they are closed for the moment while the family explores new options. It’s worth checking with them. However, that means that you’ll be the only guests occupying the place in their beautiful hand-painted Mongolian yurt. The site is only ten minutes walk from the Galley of Lorne pub, the Ardfern Yacht Centre or the Ardfern Village Store, its a great base for walking, cycling, sailing, exploring the area, or just relaxing. The yurt has its own secluded spot by the river with views to the village and Loch Craignish. How idyllic! Can’t wait to see what this family do next. I just wanted to mention the glamping at Kelburn even though the reviews are sometimes mixed. I think that’s mainly because they have been trying to update the grounds, play barn and fix the harling on the building for a while. However, I have heard good things about their glamping offering. I think this would mainly suit families with children older than 5, because the grounds are stunning, but a little rocky in places. I do think it would be a fun holiday though, near the beach of Largs. Lots of forest to explore while you camp. 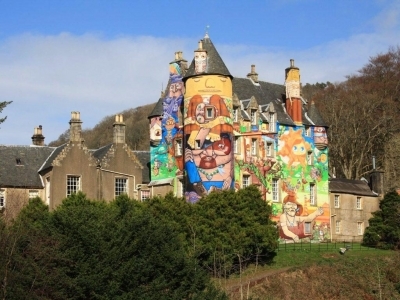 And that castle is pretty rock and roll with that incredible graffiti. They have all sorts of crazy events on for kids and even host a forest school once a week. It must be so hard to keep a huge estate going – you have to make so much money just to cover the costs, so lets give them a chance eh. In the grounds of Alexander House, Auchterarder they’ve lovingly created Bramble and Heather yurts. You’re actually getting a double yurt and wood fired hot tub with private balcony for your money here, which at the moment, as I understand, is the only place set up like this in Scotland. The views are quite outstanding, and the level of luxury of these yurts is impressive. Both yurts have king size beds, 12 foot yurt bathrooms with running hot and cold water, roll top baths with shower attachment, proper flushing loos, heated towel rails and many other home comforts - you can move from your outdoor hot tub to your indoor roll top bath! This place is for lounging and loafing, a little walking and the wonderful meditative process of keeping a fire stoked. Come here, turn off and tune out as they say. Perfect. Hope you have enjoyed this article, for more beautiful Scotland inspiration in the way of Eats, Meets and Sleeps, just search the directory.